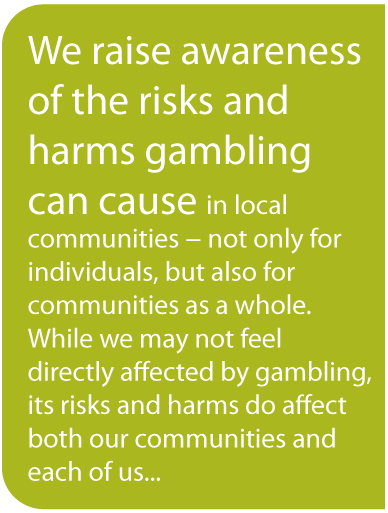 If you have an interest in helping to reduce gambling harms in Nova Scotia, and would like to volunteer with us, please let us know! We are always happy to welcome volunteers to our projects and to our board. Community change needs community involvement. Doing this work does take money. We are a registered not-for profit organization, but we have chosen not to apply for charitable status as that would limit our ability to advocate for change. (No more than 10% of a charity’s funds can be used for advocacy work.) This means that there are fewer sources of grant monies for us, so we rely more on concerned citizens like yourself to help us out. Since we are not a charity, we cannot give tax receipts for donations – but don’t let that get in the way! If you were planning to donate $100 and get a tax receipt that would result in you paying $30 less in tax, then just give us $70. It’s the same outcome for you, and we get $70 more than zero! We have no paid staff except for contracted temporary coordinators of funded projects, and our board members are all volunteers. You can donate online securely via PayPal, using the button above.